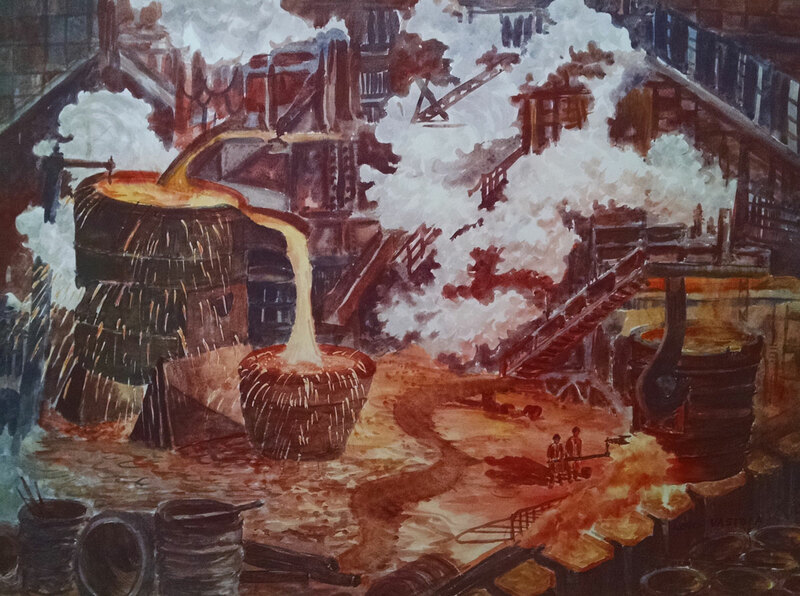 A score or so of area artist Louis Vastola’s industrial scene watercolor paintings and India ink drawings are currently on display at Art Dialogue Gallery. The works date from the early 1960s to early 1970s. One of the watercolors is a view across a mile or so of swamp terrain of a panorama array of Lackawanna Bethlehem facilities under a smoke-laden sky tinted orange to blue-gray in the rich mix of air pollutants and light of the setting sun. A rather romanticized view of the industrial complex—literally distanced by the foreground marshland—in an impressionist artistic mode more usually associated with bucolic scenes. A beautiful work, but not one of the best works on show, which are the India ink dense dark sketch and scribble depictions of plant activities and process areas, often amid torrent clouds of dark smoke and steam, evoking the splendor and danger of the work and industrial milieu. There are two sorts of romanticism (at least). A recollected in tranquility sort. Distanced, that is. And the romanticism of the thing itself. Undistanced. The adventure. The excitement. The Joseph Conrad sort of romanticism. Man against typhoon. The futile voyage around Africa and headed east, when it turns out the cargo in the hold is on fire. The India ink drawings feature the Joseph Conrad sort of romanticism. About as close as you can get to the thing itself in a pictorial representation. A drawing from 1960 shows a medley of conveyor apparatus and smokestacks just beyond a fence of some sort across the forefront of the picture, parallel to the picture baseline. One from 1972 shows an outdoor area of what might be slag heaps and junk discarded items or in ad hoc storage for maybe years or decades. A number of what look like old railroad car wheels. Some railroad track and waterway snaking through the picture. Another drawing from 1972 looks down from an elevated walkway into a production process black cloud outer sphere around inner sphere white cloud. A frequent pictorial organizational strategy is a horizontal platform of some sort across the bottom front of the picture, a viewpoint ground to stand on for artist and audience alike, and rationalizing element versus the confused jumble of mechanism and process atmospherics in the picture main subject area just beyond. A work from 1961 shows part of a lake freighter across the picture forefront, a multi-arched bridge in the background, some industrial mechanism on a small land area adjacent to the bridge, and dark clouds—weather clouds this time rather than industrial emissions clouds—overhead. One from 1977 shows a veritable explosion of smoke and steam from a Hanna Furnace coke-making operation. The watercolors by and large lack the fierce immediacy of the India ink black and whites. They rather illustrate than directly communicate the industrial scene. One meant to illustrate process—actual or imminent pour from a gargantuan conveyor bucket of fresh-from-furnace molten metal—presents a broader visual field—and hence more distanced view—than typical in the India ink drawings. And dollop random spill from the pour bucket fireworks looking more decorative than dangerous. All in all, more in the recollected in tranquility mode. The artist, who died in 1988, was primarily a landscape painter in oils, acrylics, and watercolors. He seems to have made the industrial drawings and paintings as somewhat of an artistic interest sideline. Some of his best work, however. The industrial works display continues through November 13.